Apple has just seeded Mac OS X 10.7.2 Build 11C57 for iCloud testers. The 790MB Combo Update comes less than a week after the previous Seed, 11C55. Could Apple have plans to integrate iMessage, the new all-in-one messaging app in iOS 5, into OS Lion’s iChat, an app that is indeed in need of desperate attention? Perhaps. The evidence comes from a developer who provided the following hints found in iChat’s framework in Lion. 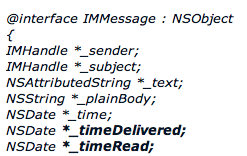 Of course it is only speculation at this point, but MacRumors guesses these elements have been added to provide cross-platform support for the iMessage protocol in iChat.